The moment we think of Virtual Reality games, the first thought that pops into the heads of many among us is horror games. And yes, games like Five Nights at Freddy’s can be great on VR, there’s more a VR can do than animate jumpscares to appear right in front of your eyes. What, you ask? Well, you’re going to love this post. There’s a ton of games a VR aficionado can enjoy, and they’re all right there on the Play Store, many of them completely free. We’re going to walk you through some of them and hopefully give you reason enough to try them all out. Let’s begin! I’ve always been a fan of the Resident Evil series of movies, and that’s how I got introduced to the games. I never connected with the games as much, though. The gameplay has always been too detached for my tastes, at least up to Resident Evil 5. Resident Evil 7 Biohazard in Virtual Reality is a long overdue bridge between the player and the game. And the VR isn’t just so you can have a more intimate sightseeing. The story and the gameplay are all pretty decently integrated, to the point you genuinely feel invested in the events. Challenging the monopoly on Counter Strike in the shooting games genre is Flats. Whoever said first person shooter games could only be done with a very in-your-face graphic interface needs to play Flats VR on Google Cardboard. And it’s not just shooting this game’s about. Your bullets bounce off of objects, so you have to remain very vigilant and scheme to get your targets even if they aren’t in direct sight. Poetry is great entertainment, provided you know all the words they poet puts in and have an imagination active enough to visualize all that’s going on in the field of the poet’s vision. For many, it comes naturally. But for most others, it is too much work to think and ponder the meaning and the metaphor. War of Words helps bring those poems a little more life so they can be experienced more directly by anyone and everyone. It’s intense, dramatic and engaging. And it certainly helps appreciate works of art better. Have you played Captain Forever before? Sure you have; it was an amazing game and really the highlight of my college days. I could play the game for days in the hostel and not be bored. Well Minos Starfighter only takes the experience forward. The games are more or less the same, only Minos Starfighter has a big ship with modern graphics you control with actual keys while Captain Forever was a 2D click-and-point sort of deal. The game is well designed with the cockpit and the shooting scenarios looking very realistic. It’s almost like being in a ship in a futuristic space movie and fighting your way to glory. 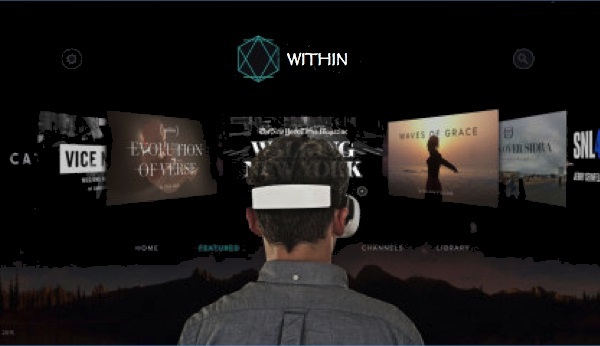 Within is a great VR experience, perhaps the greatest in the Play Store. While technically not a game, it has tons of entertainment content as well as news, documentaries and a whole lot of other stuff in 360 degree video formats that are all available for you to watch, with more being added quite frequently. Watch great content from a myriad of sources, the stars among which include the United NAtions, Apple, The New York Times, NBC, U2, Annapurna Pictures and so many more! With a Google Cardboard, you get an amazing interface to enjoy gaming in. But pointing your head at things can be a bit tiring, not to mention inaccurate. GermBuster offers you an image you can print out and make a gun out of. For the lazy people out there, just take the QR-Code-like thing and cut it out, and paste it on the first thing you find around you that looks like a gun. All you need to do is play the game and let your camera track the image. It’s amazing because this simple contraption can enable you to shoot targets at all sorts of angles, and also obtain a really impressive detail in what you see. I wish everyone made more games like this. You watched the movie because it was a prequel of sorts to the entire Harry Potter Saga. Fantastic Beasts the VR game takes the craze several steps ahead and steeps you in a first person experience of Newt Scamander’s magical suitcase. Complete spells, meet beasts and have tons of adventures in this VR rendition. It’s so good it makes you wish VR technology was a thing in the years of Harry Potter movies. Just imagine how great those EA Games’ renditions would have been! The only paid app on this list, Galaxy VR is pretty cheap and gives entertainment worth several times what it costs. Set in a format that makes the game consistently harder as you persist in it, there are 100 mission gates to unlock, where you combat while solving puzzles, race through tubes and roam desolated planets to complete missions and earn game credit. They could have developed this further, but it is pretty engaging even with this limited play field. Your brain has millions of neurons, and all of them firing in their own unique way make for all the complex and dynamic behaviors you display. InMind takes you to a future where science is advanced to let the doctor shrink and dive into the patient’s body to correct what’s wrong with it. You have to correct improperly functioning brain cells to cure the patient of mental disorders. It’s a pretty unique experience which nobody should miss. You thought Google itself would miss out on all the opportunities VR and especially Google Cardboard bring to the world? The popular video broadcasting service has a dedicated VR and 360 platform you can access right within your Android youTube app. There’s so many apps and games you can use with your VR gear and Android Smartphone. What are you going to try first?